This past weekend, I began making my way through the newest in the Danganronpa franchise, Zettai Zetsubou Shoujo: Danganronpa Another Episode, so I was expecting violence, murder, and elaborate death traps. What I was not expecting? This teddy bear abomination. 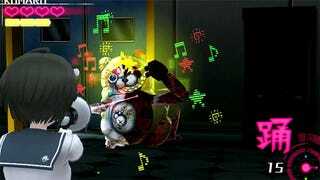 In the Danganronpa franchise, the main villain is a robotic half-black and half-white bear known as Monokuma. Of course, as a robot, he has many spare bodies. 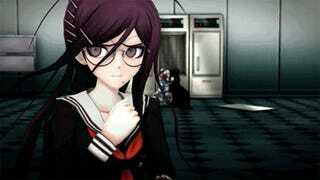 In Danganronpa Another Episode, we see and fight hordes of the villain. There are normal versions of him, versions covered in blood, versions with warning sirens on their heads, and versions that carry backpacks full of grenades. …And then there is this. 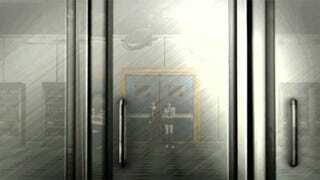 Upon returning to a hospital a few hours into the game, our heroines Komaru and Toka wander into an operation room where they are faced with a shaking cabinet. 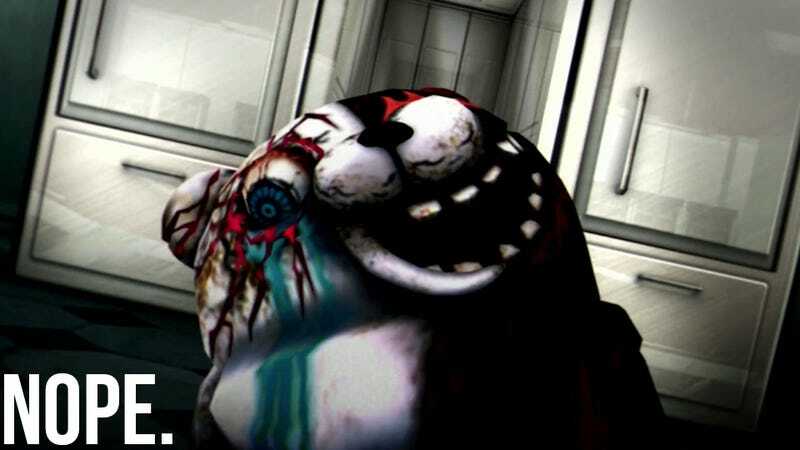 Now I don't know what I expected to come out—some Monokuma variation, no doubt—but not this eldritch horror with its bloody, bloodshot eye that's streaming tears and its disturbingly misplaced legs. Seriously, look at that. That is some nightmare-inducing stuff right there. And then it comes charging at you. It's hardly any better when you shoot it and make it dance. Okay, maybe it's a little better. Zetai Zetsubo Shoujo: Danganronpa Another Episode was released in Japan for the PlayStation Vita on September 25, 2014. There is currently no word on a Western release.